Thanks for the comment, Paul. Jon Anderson and Rick Wakeman the dream team? There’s a lot to be said for that! As Jethro Tull have done Thick as a Brick 2 and there’s Tubular Bells II and III, why nor a sequel for Yes? Good point! Now that Yes has a new lead singer, I look forward to what they will do next. My real hope is that they do not become just another touring band…. a tribute to Yes, something like what The Moody Blues do now, only tour without recording anything new. Yes should be a vibrant, viable recording venture in constant motion… in order to maintain my interest new music is a must! Although the lack of new music from 2001-2011 was extremely disheartening, the projects that filled the void were immensely wonderful. Circa:, Yoso, Anderson/Wakeman, Sherwood/Kaye, Conspiracy, Steve Howe’s Remedy…. the thought of an Anderson Rabin Wakeman project fills me with the most excitement. By the way, Kevin… another great show, great idea with the round table with great, very educated guests! I so look forward to hearing the next show. Thanks for the comment, Scott. I agree that new music is essential to the continued existence of the band – which is why I was so happy to see Fly From Here. I really must learn more about the other projects you mention – I have not investigated them yet. 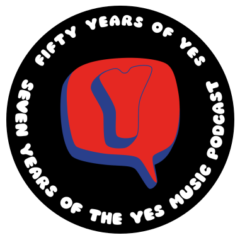 I also discovered Yes at the time of 90125 so I couldn’t agree more that the band is a multi-faceted entity – you can’t just dismiss everything after 1977 – Yes is so much more than those early recordings and shows. It grows and grows with every year that passes into the vast and complex tapestry we all love. It’s great to have you listening to and supporting the podcast so thanks again!